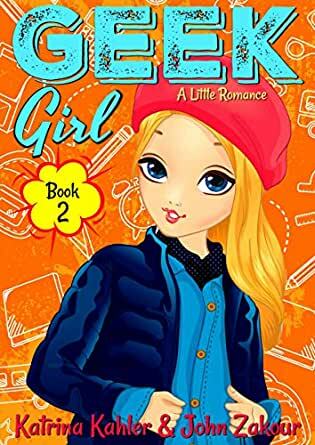 The story of Maya, the geek girl, continues with Maya having to tackle not only the city-wide robot competition but also the strange events that are occurring in her secret lab. When she discovers her grandpa's secret, she finds answers that she had not been expecting and this leads to more drama and excitement. Thanks to her friends, Tina and Tammy and even that of her younger brother, Marko, she manages to battle through. Though nothing prepares her for rivalry in the romance department. Especially from Ivy, the prettiest girl in the school who decides to take an interest in Maya’s crush, Dex. Action, humor and some unexpected laughs make this a great addition to the Geek Girl series and a fabulous book for girls 9 – 12. If you are a fan of Diary of a Super Girl you’re sure to enjoy this book as well. 5.0 out of 5 starsGREAT!!! Omg Mayas Grandpa Is A Hologram I Dont Get How It Works Cause If He Already Died How Does He Have A Hologram And How Does It Know What He Used To Know? Odd. Well It Did Say In The Book He Was Pretty Good In Making Robots And Holograms So He Probably Put His Memory In The Hologram Before He Died. Anyways This Is Kiwix (used to be Berryx) Also Please Give Me A Shoutout And Go Check My Review On Book Diary Of A Super Girl. Thank You So Much Page M And Razberri And Running_river For Giving Me A Shoutout, I Love Your Reviews Guys Keep Up The Good Work. Strawberry, Razberri, Page M, Running_river, Zz, Cherry, Summer. Have You Read The Lunar Chronicles? Do You Have A 3dDs? Thanks For Reading My Review. Your The Best Author Kk! 5.0 out of 5 starsSPEECHLESS!!!!!!!!!! Im speechless! My heart almost came out of my chest when maya- sorry no spoiler alerts, this is an amazing book by Katrina Kahler (obviously) can't say anymore awesome things about this book. Like I said "IM SPEECHLESS!!!!!!!!! !